Trust us; there is a perfect and intimate spot for romantic couples in the middle of breathtaking rock formations, a hidden lush garden, sensual watercolor sunsets, near crystal clear lakes or even at a famous and eclectic cactus nursery off the beaten path. Best of all, you don’t have to scout for an awesome, outdoor wedding location because we’ve already done the searching for you. We also offer some of the finest and most affordable wedding packages available here at Cactus Collective. 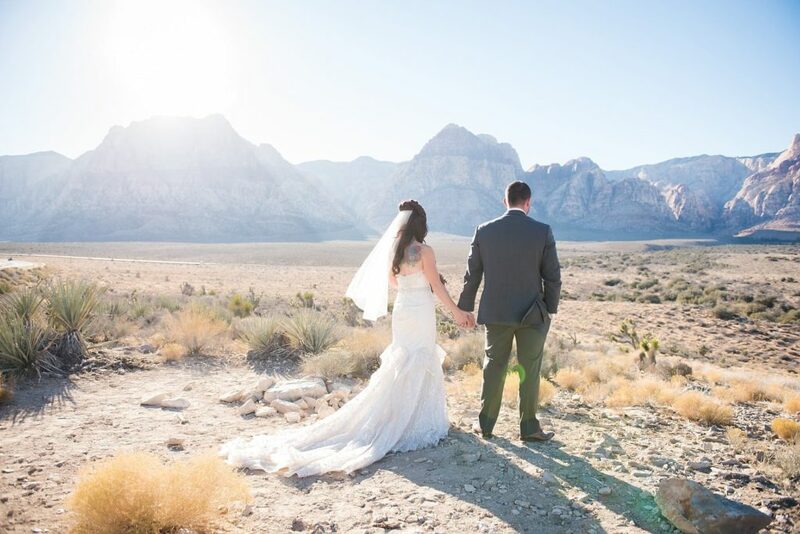 Located just about 20 minutes from the Strip, this stunning vista in the Mojave Desert provides many beautiful backdrops for your wedding day. The sunsets are among the loveliest on the planet, and there is a sereneness to the area with its impressive mountains and famous red-tinged rock formations that surround a couple celebrating their union. The photos that capture your wedding ceremony will be the most unique and truly memorable. 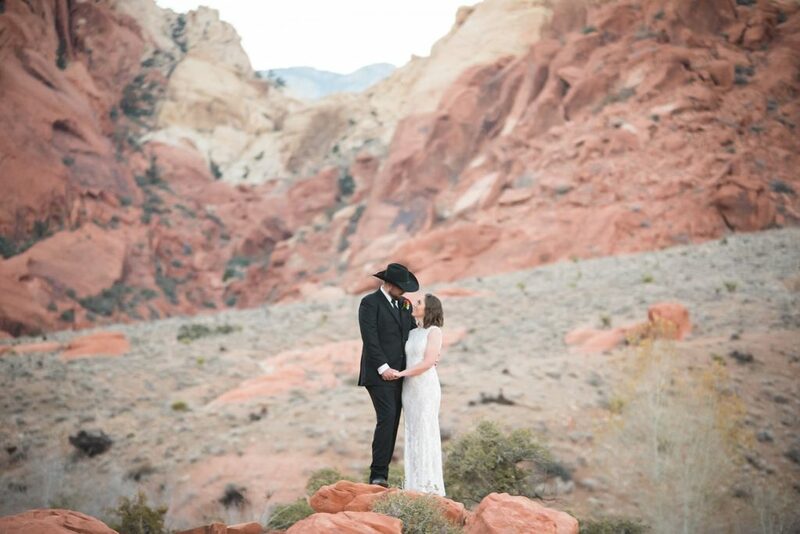 From two to fifty guests, getting married at Red Rock Canyon is very accommodating to those who share in your happiness. Our most popular packages include a modern minister, professional photography and fabulous florals. For whatever you request, we will be happy to create the perfect outdoor wedding venue. Here is another gorgeous place nestled in the famous canyon that has become a popular setting to tie the knot. 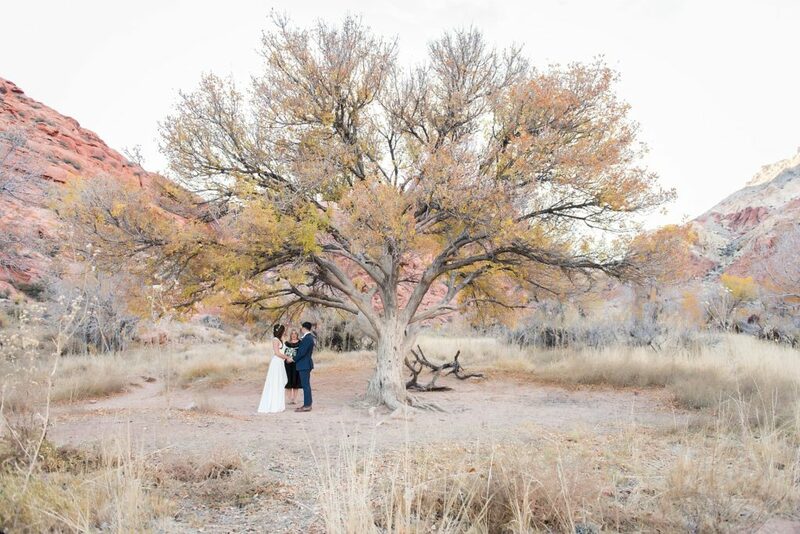 Ash Springs by the Calico Basin features striking red and white sandstone cliffs, dreamy grassland and a rustic boardwalk that can become your wedding aisle in nature. The scenery is so pretty that anywhere you stand to say “I do” creates a magical and colorful moment. Big cottonwood trees, honey mesquite and saltgrass meadows all thrive at Red Springs by the Calico Basin. The area is located at the far side of the rustic, wooden boardwalk that also greets visitors at Ash Springs. This spot never fails to deliver stunning photographs of an elegant outdoor wedding venue. Red Springs is calm, intimate and yields incredible panoramic views of the mountain range. It is nature at its finest. Imagine a park in all its greenery and smack dab in the middle of an oasis of small lakes in the Mojave Desert. Floyd Lamb Park at Tule Springs is that special place and another excellent wedding venue in Las Vegas to consider. The area has much to offer the modern, romantic couple such as plenty of rich vegetation, friendly wildlife, inviting lakes and scenic views of the Sheep and Spring Mountain Ranges. The park also features a working ranch and is an area with abundant history. It is located about 15 miles from downtown Las Vegas. 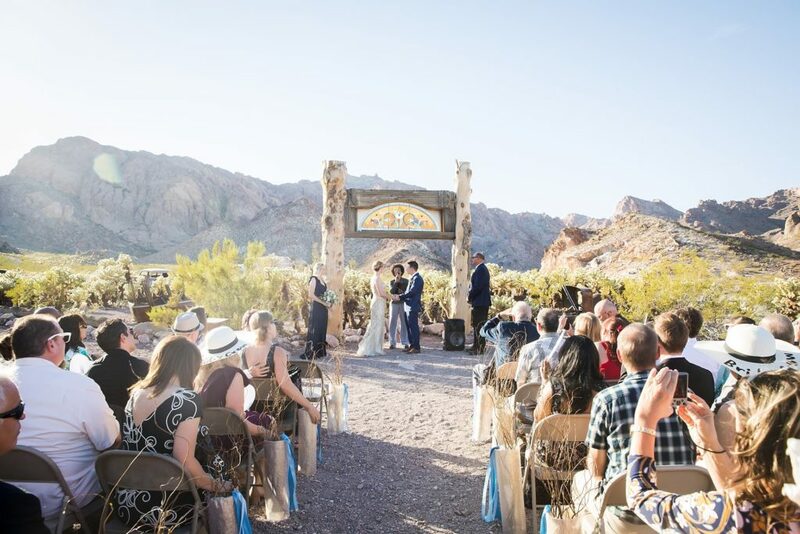 One might never believe that this location could actually exist in the heart of bustling Las Vegas (three miles west of downtown), but Springs Preserve is that hidden gem for an amazing ceremony and reception. The historical preserve offers lush desert botanical gardens, trails, a museum and a choice of sophisticated wedding venue options both for the outdoors and indoors. 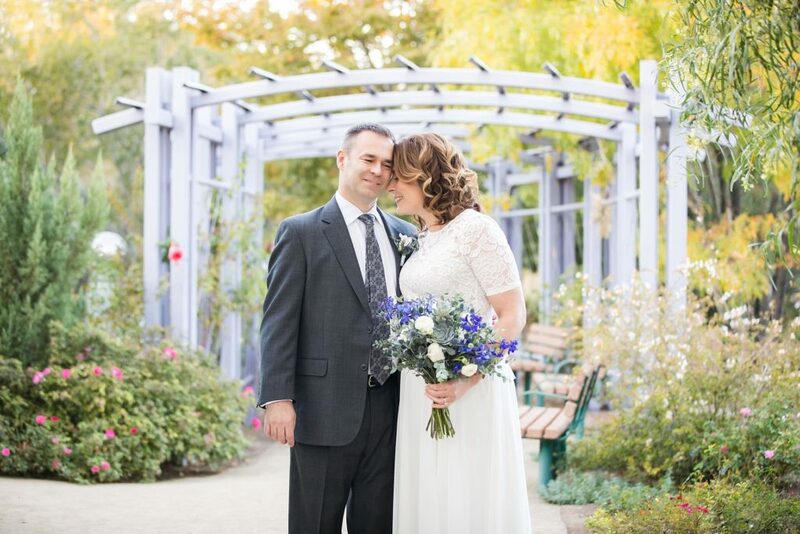 One favorite spot for saying “I do” is at the Garden Arbor that can accommodate up to 100 guests. Also, if a couple prefers a large indoor reception, Springs Preserve has available spacious, handsome banquet halls with a variety of reception package prices. Whether you’re getting married indoors or outdoors, the event is always personal, so allow us to handle all the tiny and enormous details of arranging the ideal package option for you. We are ready and able to be your personal wedding consultant. 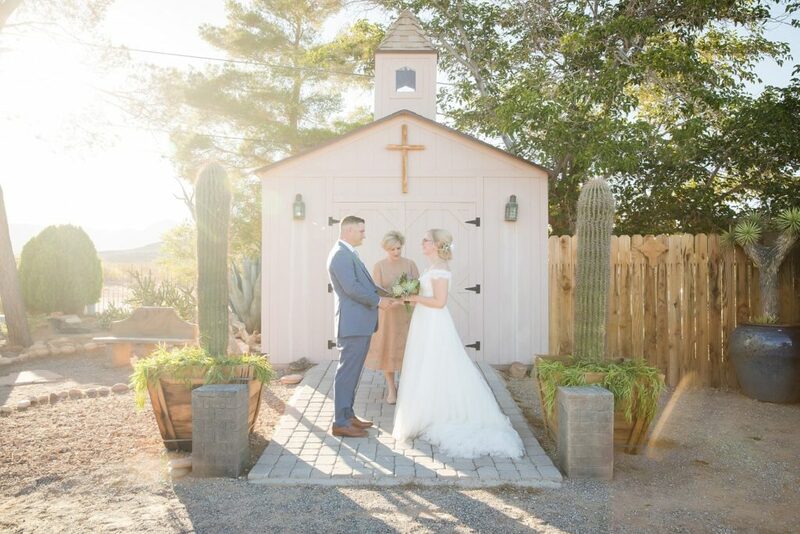 When the typical just won’t do, Cactus Joe’s delivers uniqueness in a whole new way for a couple who wants to tie the knot. First of all, the eclectic garden center en route to Red Rock Canyon features the ultimate southwestern vibe. There are rows of striking cacti and Joshua trees, beautiful pottery pieces and charming art to take in and/or purchase as a symbol of your everlasting love. Tucked away is a most charming, small wedding chapel on the premises that can accommodate up to 14 inside. Its pretty pine woodwork interior is a must-see and an ideal spot for those seeking a little touch of wedding tradition. Talk about a surreal scenery surrounding this Great Basin valley. 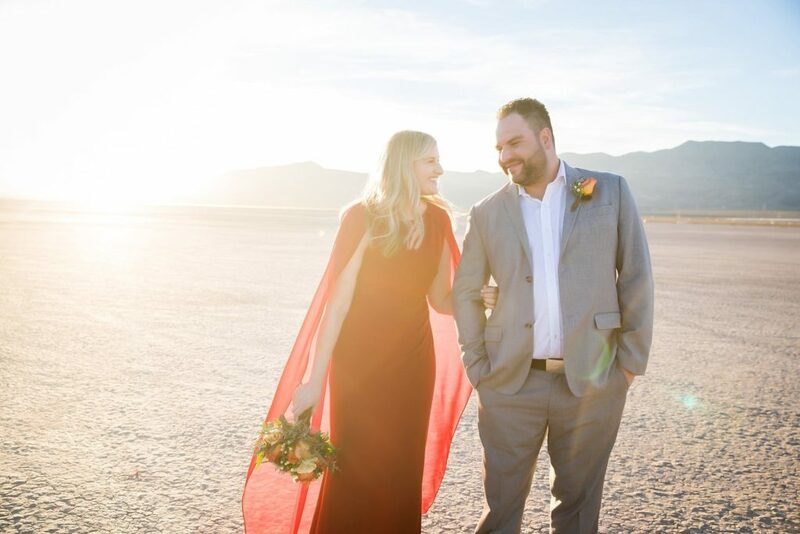 Like something out of a movie, the Eldorado Dry Lake Bed in the Mojave Desert is yet another intimate wedding venue in Las Vegas located on a huge stretch of land with an almost endless horizon. As you walk hand in hand to your wedding officiant, each step taken is over a cracked earth landscape. You will never experience this type of topography anywhere else. Tying the knot at the Dry Lake Bed is simple, serene and like living on the edge of the universe. Best of all, the spot is a mere 30 minutes from the Las Vegas Strip. It’s got the desert, mountainous backdrop, rich mining history, romance, rustic old structures and vehicles. This secluded ghost town rocks in the most vintage way for creating the ideal and non-typical, outdoor wedding location. It’s just 45 minutes away from the Strip. Couples can get married here from days gone by, and then, they can pose for photos by some awesome antiques like dilapidated barns, a saloon, antiquated gas pumps, cool vintage cars and trucks and even at the remains of an old plane crash. The vibe is a little Old Wild West and vintage Bonny and Clyde. It’s a cool fantasy wedding site. This location is vivid in all respects from its bold red Aztec sandstone formations and surrounding gray/tan limestone to its 3,000-year-old Indian petroglyphs and stunning green and blue desert flora throughout. The sunsets are phenomenal and perfect for that special outdoors-with-nature kind of wedding ceremony. Valley of Fire State Park is Nevada’s oldest park and was formed during the dinosaur era. It is one of the most enchanting spots for creating a very romantic wedding. Elephant Rock and Arch Rock dazzle the eye with their unusual formations. Let Cactus Collective create something special for you. Outdoor wedding venues often create some of the most memorable ceremonies for couples seeking adventure, a getaway destination, intimacy and breathable space and for those who want to do it their way. Beautiful Las Vegas offers all of that and much more. The city isn’t just about the bright lights, action and fast pace; it also beams with nature’s beauty, calmness and the ultimate desert landscapes that most people only dream about, read about or see in the movies. Stress is not something we recommend to couples who are trying to plan their special wedding or elopement in Las Vegas. There are wonderful venues sprinkled all over the area, but some require permits and other little details that come into play. We wouldn’t expect you to know all the rules. Here at Cactus Collective, we’ve become incredible experts at helping couples choose that perfect outdoor spot for Las Vegas nuptial bliss. When it comes to an inclusive wedding, we’ve got those bases covered. From super simple to big and bold with cake and a champagne toast, we take great pride in helping you choose from the best locations for outdoor Vegas weddings at an affordable cost. Cactus Collective believes that those extra touches matter on your special day. That is why we offer elegant additions like a luxury bouquet and/or boutonnière, an acoustic musician (violin or guitar), wood arbor with florals, videographer and more. We certainly understand how you feel. Saying “I do” is deeply personal to each couple, and sometimes, total tradition isn’t essential. You want something more, and Las Vegas delivers on all fronts. Making desert wedding dreams your reality is what Cactus Collective does.